Taxpayers may lose certain tax deductions when Congress moves ahead on federal tax reform. As discussion around tax changes increases on Capitol Hill, proposals point to a reduction in tax preference items and tax loopholes. Key tenets of reforming and simplifying the tax code include reducing the number of tax brackets, lowering marginal tax rates, and broadening the tax base. Broadening the tax base generally means subjecting a higher percentage of income to taxation by eliminating tax deductions, exemptions, and credits. In order to replace the revenue lost as a result of lowering tax rates, lawmakers must consider eliminating deductions. Published reports and discussions suggest that certain tax deductions are not on the table for elimination. These include the earned income tax credit, child tax credit, mortgage interest deduction, and charitable contribution deduction. Although both the mortgage interest deduction and the charitable deduction could conceivably remain in the tax code, both could change significantly if previous recommendations are adopted. In the past, there has been discussion about limiting the charitable deduction based on a 2% floor of adjusted gross income (AGI), similar to the various “2% miscellaneous” deductions that currently exist in the code. That would mean that charitable contributions would only be deductible against income if they total more than 2% of AGI. A taxpayer with an AGI of $100,000 would only be able to deduct contributions in excess of 2%, or $2,000. In the case of the mortgage interest deduction, previous reform proposals have suggested eliminating the ability to deduct any interest on a second mortgage or home equity line of credit, or to limit the deductibility of mortgage interest on a primary residence to $500,000, compared with the $1 million limit that currently exists. Additional tax write-offs would be eliminated as part of a broad tax package, including the deduction for state/local property taxes, state income taxes, state sales taxes, investment interest expense, as well as miscellaneous deductions such as tax preparation fees and unreimbursed employee expenses. If these deductions are eliminated or limited, some taxpayers may see a heavier tax burden. Individuals living in states with a high state income tax or high local property taxes may pay more. 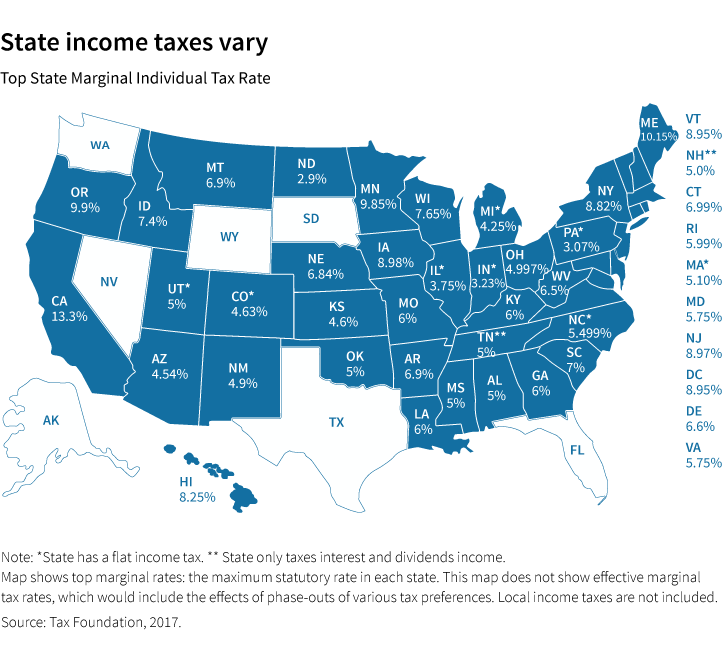 For additional detail state tax rates, the Tax Foundation has also gathered data by state and by county. To offset the loss of tax write-offs, the current tax reform proposals also include an increase in the standard deduction. Some recommend as much as doubling the current deduction to $6,350 for individuals and $12,700 for couples. This could simplify the rules for many taxpayers who could choose to claim the standard deduction instead of itemizing deductions on the tax return. Today, about one-third of taxpayers choose to itemize deductions. This total may fall to less than 10% if Congress doubles the standard deduction. Reforming the tax code is a complex process from a budget perspective as well as a political perspective. There is no guarantee that taxpayers will see substantial changes in the near future, despite the fact that one political party controls both chambers of Congress and the White House. Taxpayers should consult with their financial advisors and tax professionals to closely monitor developments around tax reform in Washington D.C. Tax reform may impact financial planning, and investors may choose, for example, to accelerate certain deductions if possible to take advantage of them before they are phased out.